Fun bohemian earrings are super lightweight! I designed these with 2 different size of antiqued copper hoops. The inner hoop I gave a Verdigris patina too. 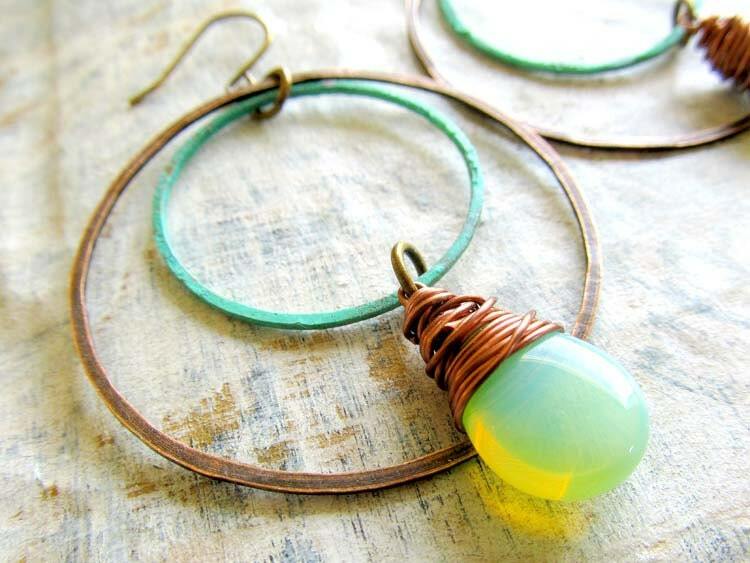 From the center dangles a pretty mint green glass bead from the Czech Republic that I wire wrapped in antiqued copper. Nickel free antiqued brass ear wires. ~Stock photos. Please allow for slight variations. Excellent seller. Speedy shipping. Well-packaged. These earrings are vibrant and absolutely beautiful. Though they have a delicate appearance, they are really quite sturdy and I expect they'll be my favorites for a long time.